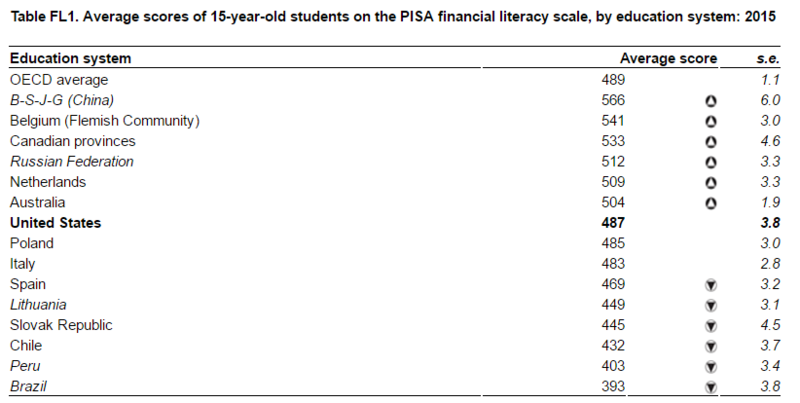 Earlier this week, the Organization for Economic Co-Operation and Development (OECD) released results from the 2015 international PISA examination. The examination, which is administered every three years by the OECD, is designed to measure science, reading and math literacy for 15-year-olds in 35 OECD member countries in order to identify trends in student achievement and provide recommendations for international education policy. Each administration of the exam focuses on a different content area, and the emphasis for the 2015 exam was science literacy. Performance in the United States was lackluster at best, with students placing 19th in science, 20th in reading and 31st in math compared to 34 other OECD countries. While there has been relatively no change in performance for science and reading over the past two iterations of the exam, math scores have fallen 11 points since 2012. Resources should be distributed equitably across schools â€“ preferentially to those schools and students that need them most. These results are sobering, but they also spark a renewed urgency to improve the quality of education and leverage opportunities such as Career Technical Education (CTE) to equip students with academic and workforce-relevant skills and set the national economy on track for future growth. Performance on the PISA exam serves not only as a signal of student academic achievement, but also of career readiness. This is a research focus of Eric Hanushekâ€™s, senior fellow at the Hoover Institution at Stanford University. In a recent panel discussion with the Alliance for Excellent Education, he argued that academic performance is tightly related to a countryâ€™s future economic health. 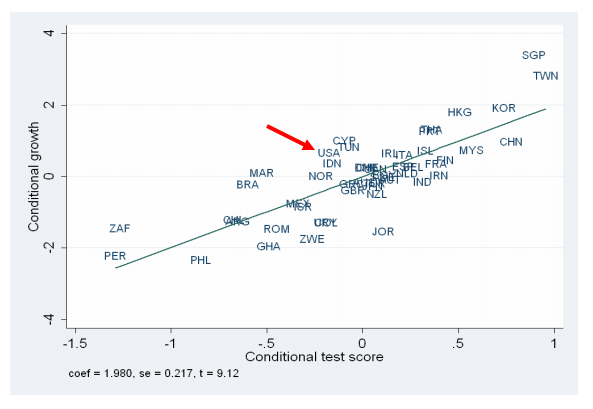 Using PISA performance as a proxy for educational quality, Hanushek finds a positive correlation between international performance and future GDP growth. In other words, the more students learn, the stronger the economy is likely to be in the future. He also uses scores from the National Assessment of Educational Progress (NAEP), a U.S.-administered assessment, to find a similar relationship across individual states. However, Hanushek makes sure not to conflate educational quality with quantity. He runs the same analysis using years of educational attainment instead of PISA scores and finds almost no relationship with economic growth. He draws the conclusion that â€œif you have more education without developing the skills, it doesnâ€™t count.â€ This conclusion echoes a finding from this yearâ€™s PISA that, in terms of science literacy performance, how science is taught is a more important factor than investments in equipment and highly-qualified instructional staff. In the intersection between education and economic growth, it is not the inputs that matter as much as the skills, knowledge and abilities students develop along the way. One strategy to prepare students for future careers in science is to increase participation in related programs of study. Programs of study guide learners through a sequence of aligned, non-duplicative courses that integrate academic and technical learning, span secondary and postsecondary systems and culminate in a credential of value. Participating in a program of study enables students to focus in a Career Clusterâ“‡ of interest and develop the skills and experiences they need to be successful in that industry. Rather than sampling a basket of different electives without developing depth of experience in any, program of study concentrators go deep in their learning. And research indicates that this could lead to positive student outcomes. 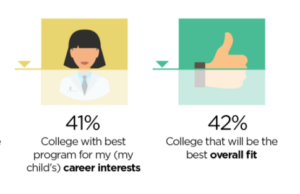 According to a recent study, participating in a program of study increases the likelihood of graduation, overall grade point average and CTE grade point average. At scale, increased participation in programs of study may lead to increased academic performance and career readiness, spurring future economic growth. With the release of the 2015 international PISA exam scores, there is newfound urgency to improve the quality of learning and increase opportunities for students to learn workforce-relevant skills, particularly in science-related fields. By leveraging high-quality programs of study, education policymakers can prepare students for future careers and spur national economic growth.